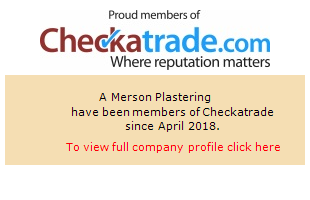 A. Merson Plastering was established in 2001 and we aim to satisfy all of your plastering needs. 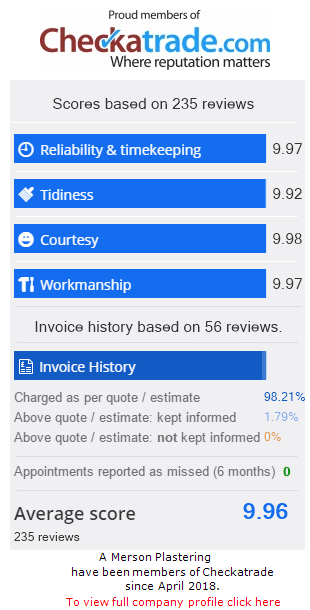 A. Merson Plastering provides a clean and reliable service that keeps our customers coming back time and time again as they refurbish their homes. No job is too small. We undertake insurance work and are based in Hemel Hempstead but cover a wide area including St Albans, Watford, Berkhamsted, Harpenden, Rickmansworth, Northwood, Bushey. We have full public liability insurance cover and we treat everyone’s home with the respect of our own, our workforce carry out a thorough and professional service with our focus not just on carrying out a high quality plastering finish but ensuring it’s completed in a timely manner with as little disruption to the home owner as possible. Please feel free to contact me for a free no obligation quote. We cover all aspects of plastering, from covering old artex to re skimming bad walls, from pebble dashing to rendering. Here's What One Happy Customer Had To Say!